​If you are building your own home, you should be providing several heating zones and considering a choice of heating sources. Systemlink is the easiest and most reliable way to zone your home and use alternative energy. ​Saving energy is vital in today's harsh world. It makes no sense to heat your whole house when you are only using part of it. You can add more zones if you need to. For instance, granny flat, office, outbuildings, etc. Zoning can be complicated for the home builder. That's why many houses just have one zone, and the only choice is heat on everywhere or off everywhere. You can also save money by using more than one heat source to take advantage of cheap energy. For instance, gas, oil, solid fuel, heat pump, or solar. This is complicated to install and control with conventional plumbing techniques. ​Systemzone makes zoning and multiple heat sources very easy. Just select the Systemzone for the number of zones and heat sources you need. Each zone and heat source is independent of all the others when you use Systemzone. Therefore each heating circuit is a separate simple job. Have a look at the advantages and safety features of Systemzone for other benefits. 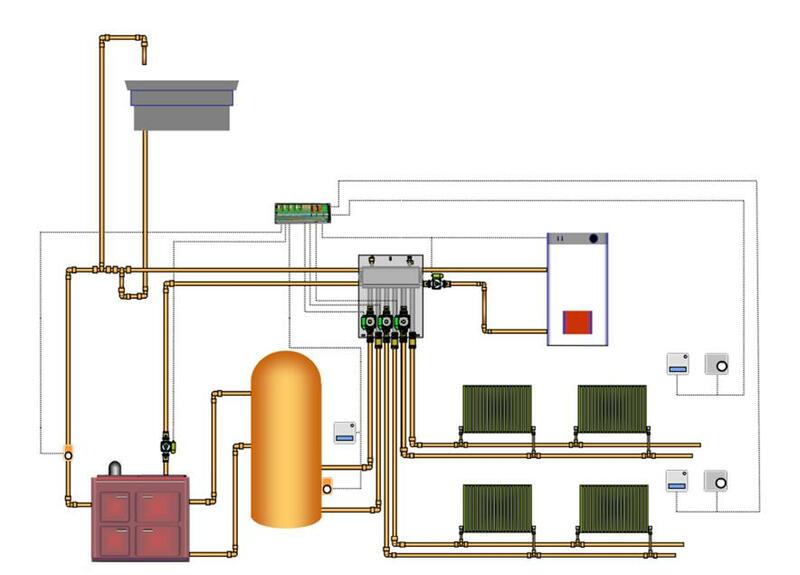 ​Here is a typical heating zone layout with two radiator zones and hot water connected to a SystemZone. There is a gas or oil boiler and an oil or solid fuel stove, also connected to the Systemzone. Either or both heat sources can be used as needed. All the controls are connected to simple numbered zone terminals on the Systemlex. See our schematics database for more technical information on this and similar layouts. ﻿Systemlink sells exclusively through heating and plumbing merchants. When you know what you need, find a stockist nearby.